The first hot air balloon is considered by most to be the invention of French brothers Joseph and Jacques Montgolfier with Joseph conducting his first experiments in 1782. He noticed how some silk clothing would billow up with the heat from the fire drying them (remember, this is before electric dryers) as well as how embers would lift up into the air. Joseph theorized there was a special gas, which he naturally called Montgolfier gas, that had the special property of “levity.” The science of these statements is, of course, quite wrong (again, see “What’s Happening?” section below), but the engineering of the balloon was the key to his success. After successful launches of models and several unmanned, full-size demonstrations, the Montgolfier brothers had to do one more test before they could get permission to have a manned balloon demonstration – they had to see if the high altitudes the balloon could reach would have a negative effect on people. So, on September 19, 1783 at the royal palace in Versailles in front of King Louis XVI and Queen Marie Antoinette, a sheep named Montauciel (“Climb-to-the-sky”), a duck and a rooster took an 8 minute balloon ride to a height of about 1500 ft. after which it landed safely. So why these livestock? Well, the sheep was included as a human analogue, meaning that if anything happened to the sheep, it would also likely happen to humans. The duck was included as a control, as ducks typically fly at high altitudes. The rooster, most likely, was included a second control as it was a bird, like the duck, but was more or less landbound, like the sheep. All three were unaffected, so the first unteathered flight by humans took place two months later on November 21, 1783. But enough history – let’s make our own model hot air balloon! I recommend creating two templates to cut out your tissue paper. If you don’t want to do this, skip to step 4, using the measurements in 2 and 3 as guides. Template A: This will be a trapezoid, measuring 20″ on the longer side, 4″ on the shorter side, with the whole thing being 26″ long. One way to do this is initially measure a rectangle 20″ x 26″. Then, on one 20″ side, mark in 8″ from each corner. Draw a straight line from those marks to the 20″ corner on the opposite side, thereby forming your trapezoid. Template B: This will also be trapezoid (but nearly a triangle), measuring 20″ on the longer side, 1″ on the shorter side, and only 16.5″ long. Similar to above, create it by first measuring a 20″ by 16.5″ rectangle, then measure 9.5″ from each corner along one 20″ side. Draw the trapezoid. Cut out 6 pieces of tissue paper using template A and 6 pieces using template B. 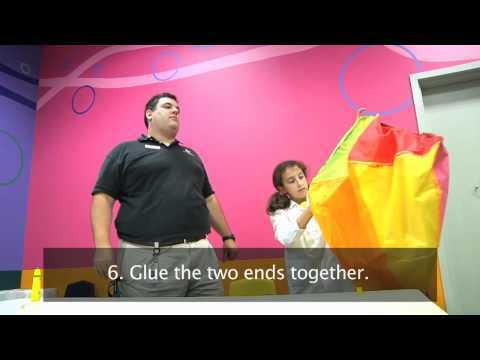 Create a “diamond” by gluing the 20″ edge of an “A” piece of tissue paper to a 20″ edge of a “B” piece of tissue paper. Make sure you totally seal the edges. Repeat #6 until you have 6 “diamond” shapes. Glue the long edges of the diamonds together until you have a large, flat sheet. I recommend letting them try a few minutes before continuing. Again, make sure that the paper is totally sealed along the edges. Now it gets tricky – glue all the short edges together. The reason it gets tricky here is that you are now forming the 3-dimensional shape of the balloon. Take it slow, get an extra pair of hands to help you, and, again, make sure the edges are totally sealed. Finally, glue the remaining long and short edge to totally seal your balloon. Remember that your top (the “B” pieces”) should be totally sealed shut, but the bottom (the “A” pieces) should create an opening at the bottom for the hot air to enter. Let it dry and check your seams. Gently blowing air from the hair dryer into the balloon will help. Attach 4-5 paper clips to the bottom opening in the balloon. This is ballast and will keep your balloon from tipping over as the hot air tries to escape. When ready, blow in hot air as fast as possible into the balloon. You should see it begin to inflate. After a few minutes, when you can feel the heat coming through the balloon, let go of the balloon and it should float up. Hot air is less dense than colder air. When air is heated, the molecules (the tiny particles that make them all up) get very, very excited and begin moving faster and faster. Doing so causes them to spread out more, so there are less molecules in a given area. In other words, there’s less of the stuff that makes up air in a given area when it is heated. You won’t suffocate, but it does make the air less dense than the cooler air. Density plays a role in why things float. For example, helium is less dense than air, which is why helium balloons float. Literally, the more dense air pushes up on the less dense helium balloon, causing it to float. Same this with hot air. Because it is less dense, the more dense cooler air pushes the warmer air up, which lifts the balloon with it. Without the ballast, the balloon would flip over releasing the hot air. Once the air in the balloon cools, it will drift back down.